A “weed”is any plant that is growing where it is not desired. In a naturalized field, wild flowers are just a component of the plant canopy. In a garden, however, those same wildflowers take nutrients, water, and space away from the desired vegetables. In a grazing pasture for livestock, broad leaf weeds often shade over and sequester nutrients and water away from pasture grasses–making the pasture less efficient for maintaining the livestock. In this picture, Evening Primose (also called “buttercup”) has taken over the stone walk path by the Daylily bed. In early spring, the primrose emerges as clusters of densely spaced, small broad-leafed plants. 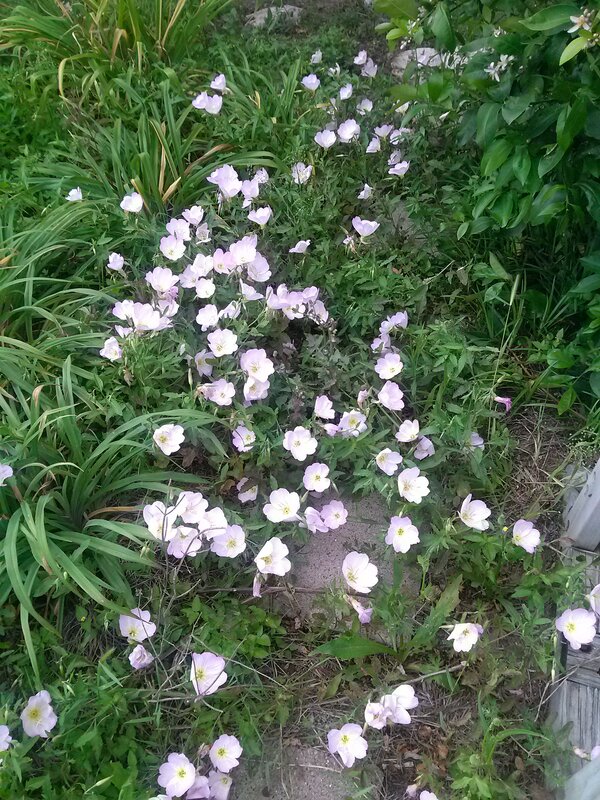 Later, the pale purple/pink blossoms open to reveal what we—as children— called “buttercups”. So, this particular “weed” has sentimental value and it is allowed to grow in some parts of the garden, especially around the daylilies. After years of keeping meticulously “clean” flower beds complete with mulching and removing every plant not intentionally placed in the garden, I have begun to take a softer approach—especially since these “weed” flowers are better able to adjust to conditions unfavorable for the intended plants. Some weeds add natural beauty to the beds.